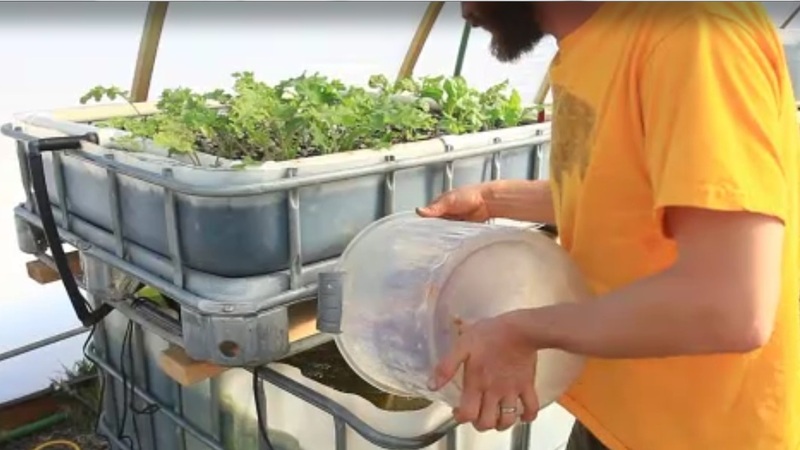 Grow fish in a “barrel” and fertilize abundant produce with it. This is not costly to set up, is very low maintenance, takes very little space, and can save $100s on groceries every month. It is hands down more efficient than growing produce in the ground. So unless you hate fish … what’s not to like? The greens are growing in gravel and the little black tube at the left is pumping nutrient-rich water up from the fish tank below into the gravel for the greens. They filter the water and it returns to the fish tank. Growing Power has a good little walk-through of how a system might work. First, you need a fish tank. Intermediate Bulk Containers (IBC) are good for this. When you search Craig’s List, search on “Totes”. You will find listings under that term. Two totes can fit into a Mazda B3000 with the tailgate down. I bought two that had non-toxic dye in them. These take a lot of rinsing! Then you cut them open and wash them. This is not what I’m doing. I am building two separate systems. You cut the top portion off of each tote to make a tray that then sits on the large bottom portion. The bottom portion of each tote is a fish tank; and the top portion, filled with gravel (shot rock with lots of surface area) or coir becomes a produce garden. Nutrient rich water is pumped from the fish tanks to the trays, where it gets filtered, and returns to the fish tanks. Imagine a closed-loop ecosystem that can fit anywhere… offering the freedom to grow food year round. I need to buy an intermediate bulk container (IBC). That’s what was used to make the rig shown in the “Pouring Fish” pic above.